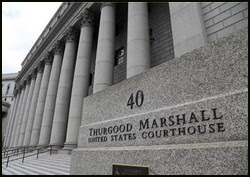 On Friday, June 23rd, a three judge panel of The United States Court of Appeals for the Second Circuit ruled in favor of New York City and District Attorney Cyrus Vance, Jr. in Knife Rights’ long-running federal civil rights case challenging the City’s policy of treating any locking blade folding knife that can be “flicked” open as a prohibited gravity knife. Knife Rights intends to petition for review of this erroneous decision by the full Court — a process known as en banc review. In a 45 page decision, the Court failed to focus on the essential constitutional problem with the law — that is, the total inability for anyone to ever determine if a knife they wish to possess is legal. Like the trial court, the Court of Appeals mistakenly focused on the past instead of the key Constitutional Due Process problem faced by folks any time they wish to choose a knife to lawfully possess in the present. The Court found that the law had, at least once in 2010, been constitutionally applied to Plaintiff Native Leather and that therefore the entire lawsuit had to fail. The Court found that Native Leather did not show that in 2010 its knives responded inconsistently to the wrist flick test and therefore it did not show that that particular application of the law was vague. But, this approach fundamentally misunderstands the key argument. The question isn’t whether Native Leather tested its knives properly in 2010. The question is whether there is any test Native Leather could ever apply and identify legal knives. There isn’t. There wasn’t in 2010, and there isn’t now. In 2010 there was no test Native Leather could have applied in order to identify knives that it could lawfully sell. That’s because the wrist flick test will never tell you that a knife is legal. Therefore there was nothing Native Leather could do in 2010 that would identify knives that were legal to sell. The Court mistakenly found that it is perfectly constitutional for the police to use a test that tells you what conduct is illegal, but does not tell you what conduct is legal. That being the case, how is a person supposed to know how to engage in legal conduct? He cannot under this Court’s ruling. Knife Rights will be filing its petition for en banc review shortly. Any knife owner in New York City or traveling through New York City, must remain cautious about possessing and carrying any lockblade common folding knife, lest they be arrested and prosecuted for possession of an illegal gravity knife. Click here for more information on New York City’s odd laws regarding carry of knives. PLEASE DONATE TODAY in the Ulitmate Steel to Support Knife Rights and you could WIN! CLICK HERE to make a TAX DEDUCTIBLE donation to the Knife Rights Foundation to support this continuing Federal lawsuit. NOTE that donating via this link does NOT enter you into the Ultimate Steel.